As much as I try to avoid being overly superstitious, it's hard not to feel a bit fearful towards this dreaded month every year where we're warned to avoid making big decisions, signing contracts, moving to a new home and of course, getting married or doing anything wedding related. It's also this month when Chinese all over the world would take extra pre-caution against accidents and sickness. Finally, it's over and it's time to celebrate! In a week's time, we will be having the Mid-Autumn Festival and it's so interesting to see how one holiday is being celebrated so differently across the region. Here in the Lion City, it's customary for families to light up pretty lanterns and to eat as much mooncakes to their heart's delight. Meanwhile, in Manila, most of us love this time of the year as it's when we play the Mooncake Dice Game (pwa tiong chiu). I'm so happy that my Fil-Chi friends who are also based here in Singapore and I will still continue the tradition by having our own pwa tiong chiu sessions in the next two weeks. 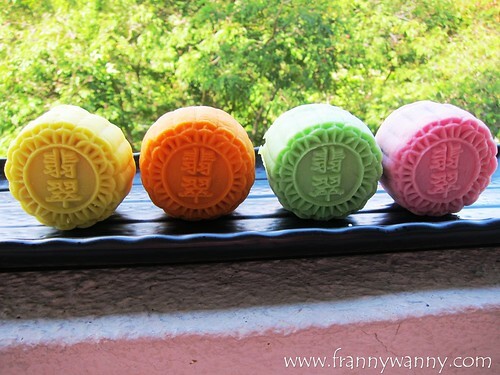 Likewise, we will also fill our tummies with mooncakes in all colors, types and fillings. Speaking of which, check out Crystal Jade Singapore's beautiful mooncake collection! We were so lucky to receive this pretty box filled with two Traditional Baked Mooncakes and four colorful delicate snowskin ones. 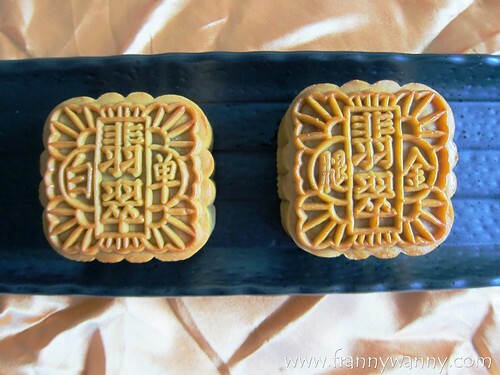 Take a close look at the Traditional Baked Mooncakes. We got two flavours to try namely the Low Sugar with White Lotus Paste with Single Yolk and the Mixed Nuts and Ham. The first one was pretty much the most popular kind which is also what we used to have a lot of in Manila. I love how the lotus paste wasn't too sweet allowing you to enjoy a bigger slice than usual. It's low sugar which I personally prefer over the no sugar type which could mean the addition of sugar substitutes. However, the biggest surprise came from the Mixed Nuts and Ham. It consists of jinhua ham which gives a nice salty kick complementing the sweet lotus paste. Normally, when I get to try mixed nuts mooncakes, I would end up so disappointed with the lack of nuts inside but this one got nuts overlapped with nuts in every bite. 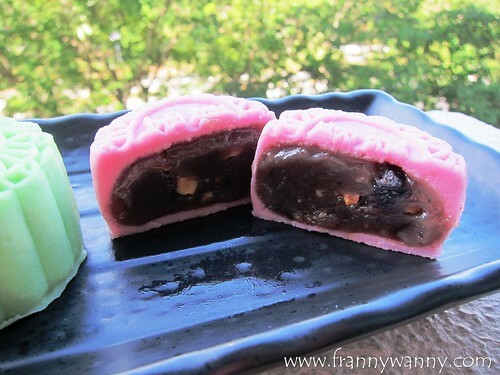 It has a nice salty, sweet and nutty flavor which will surely be a hit this Mooncake season. Moving on to the Snowskin Mooncakes, I really enjoyed trying every single piece in order to guess the flavor inside. To save you from all the guess work, let me guide you through each color. The yellow mooncake has white lotus with macadamia nut inside, the pink/purple mooncake is filled with lychee with pine nuts, the orange mooncake got blueberry with cashew nuts and lastly, the green mooncake is the most interesting with chlorella and melon seeds. My personal favorite was definitely the White Lotus with Macadamia as I love anything with macadamia nut and let's face it, it's the safest and most common flavor among the four. However, if I were to be a bit bold, then I'd go with the Lychee with Pine Nuts where the lychee has a nice sweet taste and the pine nuts brings an interesting texture in every bite. The Blueberry with Cashew was also quite good as I enjoyed biting into the tiny bits of blueberries inside. The only thing that I wasn't so crazy about was the Chlorella with Melon Seeds partially because my mind is telling me that the name sounds very foreign. It has a very strong pandan-like flavor which is actually very Singaporean in my opinion. I tried this with some Oolong Tea and I actually liked it that way. I got to say that I enjoyed all the Snowskin Mooncakes the most and I heard that stocks are quickly running out so better head over to the nearest Crystal Jade outlet near you to get your box. Hurry! Crystal Jade Singapore's Mooncake Collection is available in all outlets all over Singapore. Visit their website to know the nearest outlet to your location.